TVB’s modern romance drama Swipe Tap Love <愛我請留言> aired on March 31, replacing Storm in a Cocoon <守業者>. 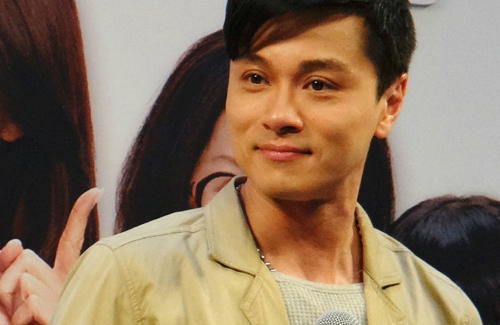 Raymond Wong (黃浩然), Elaine Yiu (姚子羚), and Kelly Fu (傅嘉莉) were present at a local mall earlier to promote the new romantic comedy. During the activities segment, each artiste took turns and called someone who was special to them. While Raymond called his 80- year-old grandmother to ask how about her well being, both Elaine and Kelly started crying fests when it was their turns. Known for her close friendship with Katy Kung (龔嘉欣), Elaine already started tearing up before she spoke to Katy on the phone. Throughout her call, Elaine thanked Katy for her continual support as a friend. Kelly called her mother to tell her how thankful she was, and promised that she will continue to work hard so she can provide a happy life for her mother, all the while trying to control her tears. Raymond portrays a near perfect father in Swipe Tap Love despite having marriage troubles with his wife, played by Elaine. However, Raymond disclosed that he is far from the ideal father in real life – he constantly has to work and because of his packed schedule, he rarely has time for his two young sons, leaving the childcare responsibilities with his wife. “My oldest son is now three years old, and my youngest is only 11 months. My wife is preparing to go on vacation with a couple of friends. She hasn’t had a vacation in four years, and this is the first time we’re trying this. When my son was young, I revolved my time around him, but now that he’s older, I hope our lives become more integrated,” Raymond said. There’s a thing called community spirit which is obviously not your thing/ Since you have no wish to answer you need not even reply to my post. Is it just me or does Raymond look kind of plasticky in that pic? Raymond might have gain some weight recently? Yeah it looks like a weight gain. I see Vincent Wong is part of the cast! I will watch this show just for him and Raymond. I wonder who the female leads are. Elaine Yiu and Kelly Fu? No, please let it be someone else! Female lead? Isn’t it Priscilla? Yes, I just checked on Wikipedia, and it’s Priscilla Wong. Watched her for the 1s time in Karma Rider. She’s a natural beauty, but her acting is okay. Let’s see how she does in a modern drama. Hope she doesn’t disappoint. Because her way of delivering her lines in Karma Rider…Was it just her natural way of talking? Her enunciation? Her trying to be cute? Just a bit distracting. Seen her in travelogue and that is her natural way of speaking except in dramas she speaks a tad slower. She does sound like she is always on the verge of tears but earlier it is probably due to fear. Now she is calmer. I do think she is very pretty in here but it is only ep 2, everyone seems miserable. Oh… That’s her natural way of talking. Hmmm…let’s hope that natural quality is not as distracting as it was in Karma Rider. Lol, I was so behind in my SIAC and ROE episodes already. I come back from my camping trip in Big Sur and there’s a new modern drama with potentially interesting plot line that just aired. What to do? So many shows, so little time! And Funn, that travelogue show she did with Tony Hung looks like a good show, because didn’t it win an award? That’s on my list of shows to watch in the future. Like I said, so many shows, so little time. Yes you are right abt the award winning show! Only if you like such shows though. Anyway do alternate between roe and siac and when done go for other lesser series. Yes, I’m alternating between ROE and SIAC. I can only concentrate on my shows when my kids are fast asleep in bed. I’m lucky if I can watch 90 minutes. LOL. When I go to your site to read up on your thoughts about an episode I just finished watching, it is so hard to skip past your most updated episodic thoughts. You will need a timetable! Luckily a series is 45 minutes only so you can watch TWO episodes. I may not be as busy as you but after a long day at work, I got only a few hours to spare, most of which is 45 min 1 episode, 45 min another episode. Sometimes shorter because recorder somehow could not record, and this happened twice to ROE. Thank you. I will take that as encouragement when I do write for another! Funn’s episodic thoughts may be longer compared to others who give you only an overall review of the show. Her writing is unique. They are her own opinions and she’s not afraid to express her honest opinion about the show, actors, etc. I find that refreshing. There will be people out there who will respond negatively to your writing. Can’t please them all, can we? Just ignore whatever mean, rude remarks they direct at you. Don’t let them get that satisfaction of getting a reaction out of you. Thank you and you’re not the first to advise me so. I think I will heed such advice for once and just ignore ignore ignore. there are a lot of people said Priscilla’s acting is not good enough to be a lead; I have never watched her so far; because Funn said she is very beautiful in this series, per half I should watch it.